This entry was posted on February 6, 2011 by Olive. It was filed under Raw Food . both. the IDEA is from cherishing your loved ones and having a good time, and has been basically that until roughly 1900s. from then on, new businesses snatched up the chance to make money off of this seemingly easy chance. duh, Carla. It’s a drinking holiday. Just with a different theme. Very similar to St. Patty’s Day and Cinco de Mayo. Viva!! Oh Carla! You little sweetheart. 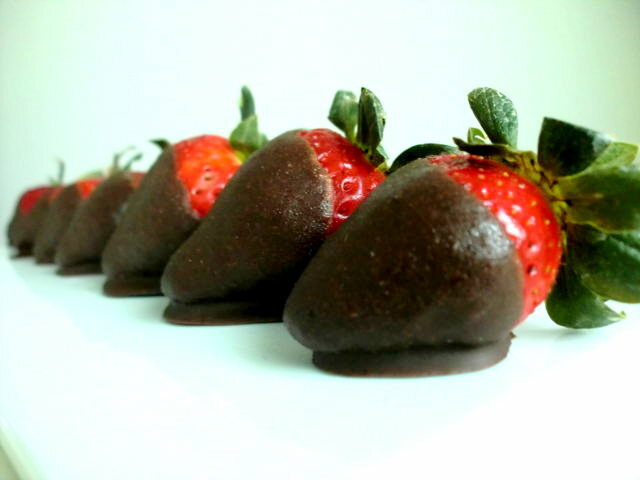 Giving us all a Valentine’s gift of strawberries and chocolate! They look like yummy little soldiers all lined up in their uniforms of red, black, and green! I might even make ’em as you make it look so easy! Yet again such brilliant work. The photo is elegantly simple, stunning in the layout and lighting. I adore the photograph as well, very well done. Chocolate covered strawberries are my all time favorite! Thanks for this recipe! I think it’s a day to make money. We have commercialized it just like Christmas. If my loved one can only come up with one lousy day out of 365 to show/tell me he loves me, there’s a serious problem. But I really enjoy seeing the pretty colors of red and pink, the glitter, cookies, frostings, flowers and balloons (none of which *I* receive but it’s still pretty!). Molly, I could not absolutely agree with you more! My husband and I don’t celebrate it as we show each other everyday. But I do love seeing all the red and pink decorations! I treat all holidays as if they don’t have *anything* to do with retail. In other words, I hand-make everything I gift to others, write and make cards, do favors for people. Anything to get away from the traditional “shop until you drop” — of course, nobody tells you that you drop not because you’re on your feet too long, but because you’ve bought and eaten too much processed food, polluted the world with useless junk, and spent your money on things that hurt global economy, local economy, and planetary ecology. So, I just ignore all the Valentine’s advertisements and make a point to do something special for my husband. Yummy. 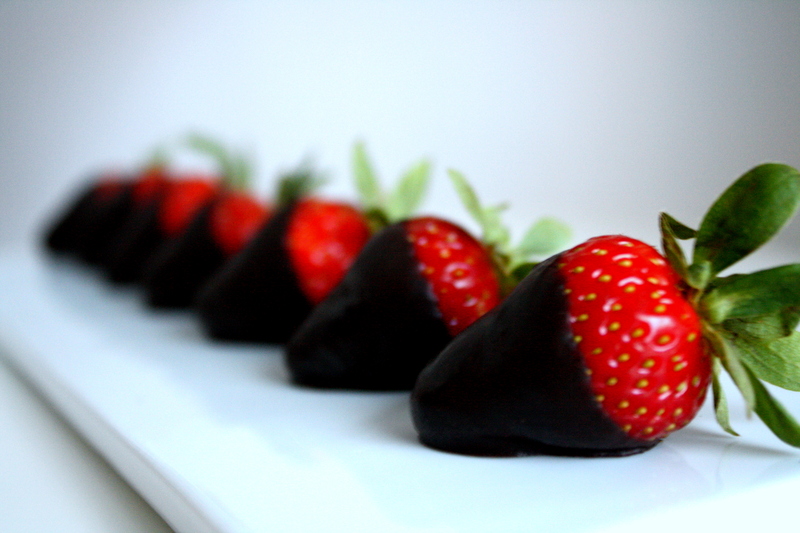 I love strawberries and dark chocolate. I am going to try this as a treat to myself. Carla, my love, I invited some girlfriends over for dinner tonight (one is trying vegan for a couple weeks and was stumped for recipes so thought it would be fun to make food all together) and we made these for desert, soooo easy and yet beautiful and DELICIOUS! We were licking the chocolate from the pan and mixer, just like back in the day 🙂 Soooo good. 🙂 thank you, thank you, than you! you made the dinner party a smash hit. Plus getting to eat your creations is like having a little bit of your presence at the party, but I still want the real thing. Can’t wait to see you soon. Thank you Makinnna for the fantastic comment and feedback! I’m so happy you made and served them at your dinner party! Sarah said you made the best raw food! And don’t worry, I will bring a few raw treats for you when I see you in Palm Springs!! I made these recipe today and LOVED IT! Thank u so much for sharing! I hope it’s OK, I published the recipe on my blog! Thank u so much for a LOVELY blog!! !